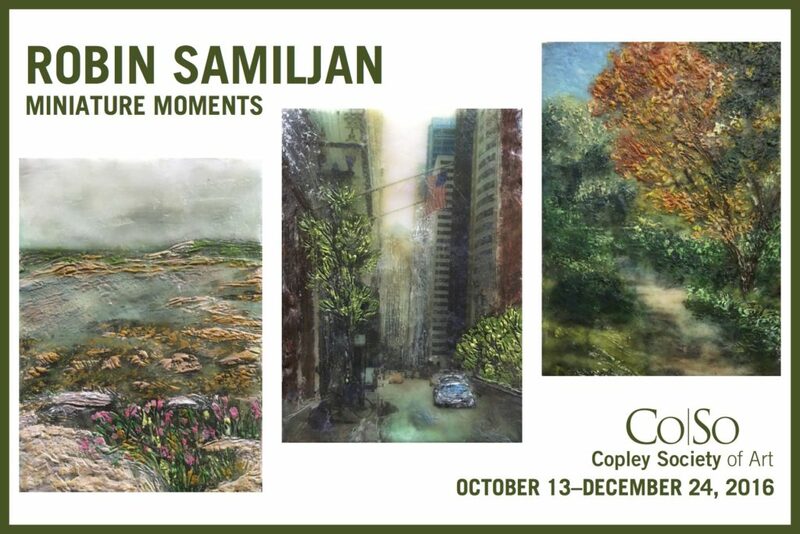 The Copley Society of Art is proud to present Miniature Moments, a solo show of encaustic works by Robin Samiljan in the Red Room Gallery. This exhibition opens with a reception on Thursday, October 13th from 5:30 to 7:30pm at the Copley Society, located at 158 Newbury Street, Boston, MA 02116, and continues through December 24, 2016. The smaller gallery space in the Red Room combined with the small-scale size of Samiljan’s works promises to be an intimate viewing experience. Samiljan’s subject matter varies between natural landscapes and urban Chicago scenes. Regardless of the subject, the common denominator is bold layers of colors. Samiljan will be holding an artist talk in the gallery on Saturday, October 15th from 1:00 to 3:00pm. Samiljan’s inspiration comes from the relationship between people, places and things. In her words, “My artistic goal when I paint miniature works is to carry the viewer on a tangible, unexpected journey.” Inspired by the Thorne Miniature Rooms on her visits to the Art Institute of Chicago growing up, she strives to create small works of art with the same intricate attention to details. The Copley Society of Art (Co|So), America’s oldest non-profit arts organization, is committed to the advancement, enjoyment, and promotion of its member artists and the visual arts. The organization, founded in 1879, comprises juried artists who are selected by a credentialed art committee.